Recent Advances in the Analysis of Marine Toxins, Volume 78, the newest release in the Comprehensive Analytical Chemistry series, presents chapters from the best authors in the field, making it an essential resource. 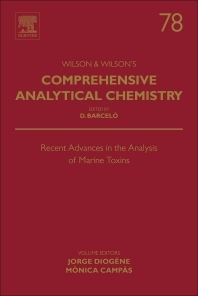 Updated sections in this new volume include topics such as The importance of toxin detection and quantification: environmental issues, public health, food safety, animal health, bioterrorism, bioactive compounds, medical approach, an LC-MS/MS analysis of marine toxins, Animal bioassays: identification of toxins and mechanism of action, Receptor binding assays for the analysis of marine toxins, Immunoassays and optical biosensors (visual, SPR, fluorescence) for marine toxins, and Electrochemical biosensors for marine toxins. Chapters in this ongoing series contain practical and useful information, describing real advantages and limitations. Experts in this field contribute based on their research and personal point-of-view. Jorge Diogène (Barcelona, 1962) is currently Senior Research Scientist and Director of the Marine Monitoring Subprogram at IRTA (Catalonia, Spain) dealing with the food safety of aquaculture and fishery products in Catalonia. Jorge Diogène has a PhD. in Applied and Fundamental Toxicology (Université Paris 7, France, 1993), Master in Marine Biology (University of South Alabama, USA, 1988) and graduate studies in Biology (Universitat de Barcelona, Spain, 1985). His research interests are oriented towards the evaluation of toxin production by microalgae and their presence in fish, shellfish and the environment, and method development for marine toxin quantification and risk assessment, including cell-based assays used to identify and quantify the toxicological potential of toxins. His research has contributed to a better understanding of several groups of toxins (Ciguatera, PSP, DSP, Cyclic Imines) and toxin-producing microalgae in different geographical areas (Mediterranean, North Atlantic, Macaronesia, Caribbean, Indian Ocean, Chile). He is in charge of the monitoring for the Quality of Waters in Shellfish harvesting areas of Catalonia. J. Diogène has been head of several research projects ( out of 27), director of 7 PhD thesis and author of 98 scientific articles (68 SCI). He has been chairman in several international conferences and he is scientific reviewer of the journals “Food and Chemical Toxicology”, “Toxicology in Vitro”, “Journal of Natural Toxins”, “Toxicon”, “Analytical Chemistry” and “Aquaculture”. J. Diogène has developed his career in different laboratories and institutions in the United States (University of South Alabama; Food and Drug Administration), France (Université de Paris 7; Institut National de la Santé et de la Recherche Medicale), Canada (Université Laval) and Spain (Instituto Español de Oceanografía, IEO, UNESCO and IRTA). J. Diogène launched in 1996 the Intergovernmental Oceanographic Commission (IOC-FAO) IEO-IOC Science and Communication Centre on Harmful Algae in Vigo, Spain, a center that is in charge of capacity building and cooperation in the field of harmful algae. J. Diogène actively collaborates with the Spanish (AECOSAN), Catalan (ACSA) and European (EFSA) food safety agencies. Mònica Campàs (Amposta, 1973) graduated in Chemical Sciences in 1996 and obtained the European PhD in Chemical Engineering in 2002 from the Universitat Rovira i Virgili (URV). In her doctoral thesis she developed a new method to produce DNA biosensor arrays, which was patented. In 1999, she did a doctoral stay in Ireland, at the Laboratory of Biosensors of the University College Cork (UCC), to learn about piezoelectric biosensors. In 2003 she started a postdoctoral stay in France, at the BIOMEM group of the Université de Perpignan-Via Domitia (UPVD), originally part of the Centre National de la Recherche Scientifique (CNRS). There, she initiated a research line on biosensors for the detection of toxins from aquatic media. She also carried out lecturer activity in the Department of Biological Engineering. In 2007, she came back to Spain and started her research career at IRTA through a “Beatriu de Pinós” research contract offered by the Generalitat de Catalunya. In 2009, she was awarded with a 5-year “Ramón y Cajal” research contract by the Ministerio de Ciencia e Innovación. Since 2014, she has a permanent position at IRTA. She has published 50 articles (44 SCI) and 8 book chapters. She has participated in more than 90 congresses. Since her arrival at IRTA, she has been principal investigator of 9 research projects and 1 research contract, being the coordinator of an INTERREG SUDOE IVB project. She has also participated in other 7 research projects. She has directed 1 PhD thesis and she is currently directing 3 more. She has been invited to 2 Master and 11 PhD theses juries (Poland, France, Northern Ireland and Spain). She has also been invited by ZEU-Inmunotec to participate in the validation study of the TOXILINE-DSP kit and by Neogen to participate in the validation study of the PST test kit. She has been invited to give seminars and courses in Concepción (Chile), Ermatingen (Switzerland), Boston (USA) and Dublin (Ireland). She is a member of the scientific committee of the “Transfrontier Meeting on Sensors and Biosensors”, which she organised in 2010.